LEVO G2 Deluxe Floor Stand for Books is a heavy duty adjustable rolling stand which allows users to sit, lay back, or lie in bed while securely reading their book - hands free! The sturdy build quality and solid design minimize bouncing and largely prevent tipping, ensuring hassle-free reading comfort. A key feature of this unit is the 5-axis articulating arm which offers easy positioning and adjustable tension - allowing optimal positioning in all 3 dimensions. The LEVO G2 Book Holder is ideal for users reading while working out, reading while recovering from injury or sickness, or enjoying a book in their favourite easy chair. 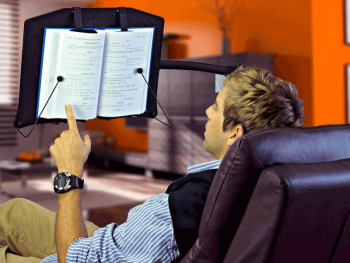 The arm adjusts from 30" to 56" in height (i.e. from floor to center of book platform). It is mobile, durable, versatile, quick and simple to adjust, and no tools are required. The LEVO G2 Deluxe Floor Stand features a professional Gunmetal finish.